Alumna social entrepreneur Gayle Jennings-O’Byrne is changing the market for women entrepreneurs of color. A room full of MBA students lean closer to hear what Gayle Jennings-O’Byrne, W’91, will say next. 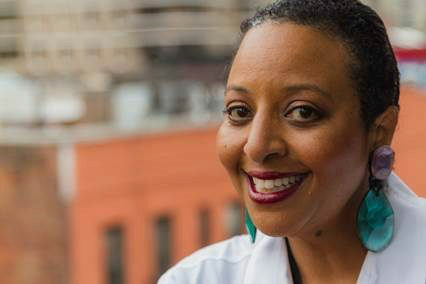 It’s now April 2018, years after her diagnosis, and she reveals the vow she made during her battle with cancer, “I was thinking, if I live, then I want to do something with my life that has purpose…so I founded iNTENT Manifesto with a mission to drive $1 billion to women of color tech entrepreneurs.” Every student in the room, all members of the Wharton Social Impact Club, nod in admiration and solidarity. But after decades of working in finance and technology, and surviving cancer, where did that grit—to want to change how and where investors are deploying capital—come from? Gayle attributes it to her mother, whom she describes as one of the very few women of color working in technology in the early days of Silicon Valley, similar to the women depicted in the 2016 film Hidden Figures. Gayle realized that today, only a tiny percentage of venture capital dollars are going to startups founded by women or women of color. Additionally, there are many more investable opportunities (especially ventures founded by women of color) that aren’t receiving funding at all. Enter iNTENT Manifesto, a financial education platform designed to impact women of color founders and entrepreneurs in the tech space. Invited by Wharton Social Impact Initiative, Gayle visited campus as a Nazarian Social Innovator in Residence. She met with students across Wharton and Penn, talking about why she will commit the rest of her career to changing the landscape of the venture capital market. The Nazarian program brings innovative business leaders like Gayle to campus to demonstrate how they’re having real-world impact. Fully recovered from cancer, but still healing from a broken ankle that had her on crutches, Gayle’s energy nonetheless matched students’ energy as they peppered her with questions about their career plans, pitches, ventures, and goals. Over two days, Gayle met with over fifty other students. “First, make sure you sign the Manifesto!” proclaimed Gayle to every student. She was referring to the iNTENT Manifesto pledge on her website that calls for people to “intend to change the world,” “influence and invest with intentionality,” “seek diversity,” and more. “Hundreds of women are launching and leading firms every day,” so Gayle stressed the importance for investors to advocate for diversity within their portfolios. She remained firm in her belief that a woman of color will create the next innovative technology solution. These points resonated with the members of the Black Wharton Undergraduate Association (BWUA) who met with Gayle to discuss their career aspirations and questions. She empathized when some said they find themselves to be the only person of color on their team, but she also insisted that they recognize themselves as the changemakers of future. “You could be the person one day deciding the deals,” Gayle said, and it is her hope that Wharton and Penn students will lead the way in transforming the market for women entrepreneurs of color. Gayle launched iNTENT Manifesto in March 2018. With good design, intent, and investments, iNTENT Manifesto transforms how people can support, invest, and celebrate women of color technology entrepreneurs. iNTENT Manifesto is a social enterprise located in New York City, with programming and partners across the country. WSII looks forward to supporting Gayle’s work through our Social Impact Fellowship program, and hosting potential speaking engagements on campus in the future.